"Wow, gorgeous shoes... Any recommendations for cheap (but expensive-looking!) businessy flats? I need to go shoe-shopping for an upcoming job interview. 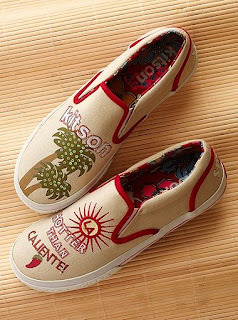 That and all my shoes are either brown, boots, lime green, bright blue, or have sushi patterns on them." Okay Miss Sushi Shoes, let's get started! I think we should schedule a playdate so our shoes can meet and get to know each other. The flats had to be extremely simple - "not even a bow on them." MSS wears a large shoe size and considers her feet to be fairly wide. 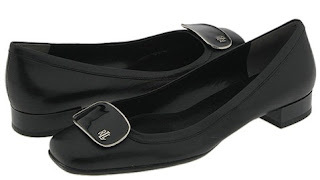 The interview's on Tuesday, which means no Internet orders (darn, because I saw some cute flats on Piper Lime). Numerically speaking, her budget is $100 or below and $120 max. She doesn't want to spend "too much" but she still wants good-quality comfy shoes she can wear for a long time to come. Since it seems like she has every type of shoe except the basic black shoe that would look professional in an interview situation, I'm inferring from the help request that this is exactly what she's looking for. My first recommendation would be to stop by the A&N shoe sale and see what they have. When I was there, they had a whole wall of simple quilted patent leather flats in red, navy, black, and gray for around $20 a pair - plus you never know what you'll find on the shelves. However, the A&N shoe sale is also kind of a crap shoot if you're looking for something as specific as a pair of simple flats. If you don't find what you're looking for there, I suggest hitting up the next couple of places. Just a hop, skip, and bus ride away from the A&N location downtown, the downtown Bay location has a droolworthy shoe department with a great selection. The reason why I'm recommending The Bay in particular is that this year they started carrying Lauren by Ralph Lauren stuff, a relatively affordable yet expensive-looking line that features a lot of classics. One of my all-time favourite pairs of flats is a black-and-white tweed pointy-toed pair with black velvet bows from Lauren by Ralph Lauren which, incidentally, I scored at last year's A&N shoe sale. I don't know exactly what The Bay will have, but a quick gander at the Zappos selection for Lauren by Ralph Lauren yielded these black leather beauties. I know she said no bow or detail, but the black ornament on the vamp makes it look expensive and classic, and it's the same colour as the rest of the shoe so it blends in. The next stop that could yield some definite possibilities is Naturalizer, a chain known for their insanely comfy, work-appropriate leather shoes. 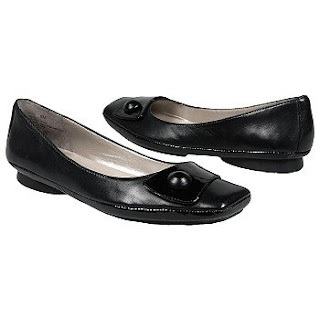 Plus, Naturalizer shoes come in narrow, medium, and wide fits to suit every foot shape. I kind of wish I'd found the Dumia mary-jane when I was doing my mary-jane post. Once MSS goes out shoe-shopping she'll probably find a lot more possibilities than the ones I recommended above; flats have been in for a couple of seasons already and they come in so many colours and styles. MSS, if you're reading this, good luck with your job interview! Omg, I really like the naturalizer shoes. They look so... comfy, and yet the patent mary janes are still stylish. I'll have to check them out. And I got a lot of work done today so I feel like I can justify a few hours of shoe shopping. And hmm... those Kitsons look awfully familiar! Possibly like the multiple pairs stashed away in your bedroom, awaiting spring. Oh wait, it is spring! 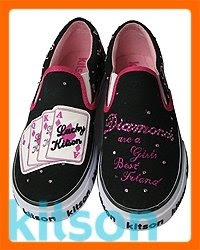 How about these shoes: http://http://www.hula-la.com/girl_images/wahwah.jpg Er, too bright? I followed the link and looked at the shoe; those are really cool! I like the bright blue and the pink lotus flowers, but truthfully the face on the vamp of the shoe kind of freaks me out. I think if I wore them I'd be scared of looking at my feet and seeing my shoes stare back at me. Ah Lisa, your blog is always such a good distraction! Love those Lauren flats; I've been meaning to check out the Bay myself lately, I keep hearing how they are getting much more fashionable these days - not just for old ladies! I particularly like the jewelry section in the Bay at Pacific Centre because they have cheap, pretty options for girls on a budget. And the Bay has a Calvin Klein lingerie sale on right now. Pretty undies ranks up there with shoes in my books. Hello, retail therapy! I also bought a pair of super comfortable, very pretty pair of Think! sandals, although not at the Bay. They have a pretty good sale on shoes though right now - 30% off or something like that. Worth a trip down there. My justification for these purchases was a commitment to wear my slightly less stylish but perfectly good pair of black flats. That way when I get a/the job, I can spend more money on another pair of LIME green shoes, hurray! I already even have the pair picked out.